This article is about the African country. For other uses, see Togo (disambiguation). Togo (/ˈtoʊɡoʊ/ ( listen)), officially the Togolese Republic (French: République togolaise), is a country in West Africa bordered by Ghana to the west, Benin to the east and Burkina Faso to the north. The sovereign state extends south to the Gulf of Guinea, where its capital Lomé is located. Togo covers 57,000 square kilometres (22,008 square miles), making it one of the smallest countries in Africa, with a population of approximately 7.6 million. From the 11th to the 16th century, various tribes entered the region from all directions. From the 16th century to the 18th century, the coastal region was a major trading center for Europeans to purchase slaves, earning Togo and the surrounding region the name "The Slave Coast". In 1884, Germany declared a region including present-day Togo as a protectorate called Togoland. After World War I, rule over Togo was transferred to France. Togo gained its independence from France in 1960. 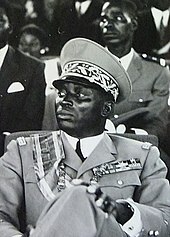 In 1967, Gnassingbé Eyadéma led a successful military coup d'état after which he became president of an anti-communist, single-party state. Eventually in 1993, Eyadéma faced multiparty elections, which were marred by irregularities, and won the presidency three times. At the time of his death, Eyadéma was the longest-serving leader in modern African history, having been president for 38 years. 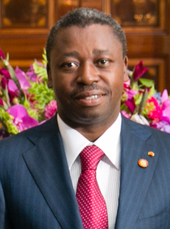 In 2005, his son Faure Gnassingbé was elected president. Togo is a tropical, sub-Saharan nation, whose economy depends highly on agriculture, with a climate that provides good growing seasons. While the official language is French, many other languages are spoken in Togo, particularly those of the Gbe family. The largest religious group in Togo consists of those with indigenous beliefs, and there are significant Christian and Muslim minorities. Togo is a member of the United Nations, African Union, Organisation of Islamic Cooperation, South Atlantic Peace and Cooperation Zone, Francophonie, and Economic Community of West African States. Archaeological finds indicate that ancient tribes were able to produce pottery and process iron. The name Togo is translated from the Ewe language as "land where lagoons lie". Not much is known of the period before arrival of the Portuguese in 1490. During the period from the 11th century to the 16th century, various tribes entered the region from all directions: the Ewé from the east, and the Mina and Gun from the west. Most of them settled in coastal areas. The slave trade began in the 16th century, and for the next two hundred years the coastal region was a major trading centre for Europeans in search of slaves, earning Togo and the surrounding region the name "The Slave Coast". In 1884, a paper was signed at Togoville with the King Mlapa III, whereby Germany claimed a protectorate over a stretch of territory along the coast and gradually extended its control inland. Its borders were defined after the capture of hinterland by German forces and signing agreements with France and Britain. In 1905, this became the German colony of Togoland. The local population was forced to work, cultivate cotton, coffee and cocoa and pay high taxes. A railway and the port of Lomé were built for export of agricultural products. The Germans introduced modern techniques of cultivation of cocoa, coffee and cotton and developed the infrastructure. During the First World War, Togoland was invaded by Britain and France, proclaiming the Anglo-French condominium. On 7 December 1916 the condominium collapsed and Togo was divided into British and French zones. 20 July 1922 Great Britain received the League of Nations mandate to govern the western part of Togo and France to govern the eastern part. In 1945, the country received the right to send three representatives to the French parliament. After World War II, these mandates became UN Trust Territories. The residents of British Togoland voted to join the Gold Coast as part of the new independent nation of Ghana in 1957. French Togoland became an autonomous republic within the French Union in 1959, while France retained the right to control the defense, foreign relations and finances. The Togolese Republic was proclaimed on 27 April 1960. In the first presidential elections in 1961, Sylvanus Olympio became the first president, gaining 100% of the vote in elections boycotted by the opposition. On 9 April 1961 the Constitution of the Togolese Republic was adopted, according to which the supreme legislative body was the National Assembly of Togo. In December 1961, leaders of opposition parties were arrested because they were accused of the preparation of an anti-government conspiracy. A decree was issued on the dissolution of the opposition parties. Olympio tried to reduce dependence on France by establishing cooperation with the United States, Great Britain and Germany. He also rejected efforts of French soldiers who were demobilized after the Algerian War and tried to get a position in the Togolese army. These factors eventually led to a military coup on 13 January 1963, during which he was assassinated by a group of soldiers under the direction of Sergeant Gnassingbé Eyadéma. A State of emergency was declared in Togo. The military handed over power to an interim government led by Nicolas Grunitzky. In May 1963 Grunitzky was elected President of the Republic. The new leadership pursued a policy of developing relations with France. His main aim was to dampen the divisions between north and south, promulgate a new constitution, and introduce a multiparty system. Exactly four years later, on 13 January 1967, Eyadéma Gnassingbé overthrew Grunitzky in a bloodless coup and assumed the presidency. He created the Rally of the Togolese People Party, banned activities of other political parties and introduced a one-party system in November 1969. He was reelected in 1979 and 1986. In 1983, the privatization program launched and in 1991 other political parties were allowed. In 1993, the EU froze the partnership, describing Eyadema's re-election in 1993, 1998 and 2003, as a seizure of power. In April 2004, in Brussels, talks were held between the European Union and Togo on the resumption of cooperation. Eyadéma Gnassingbé suddenly died on 5 February 2005 after 38 years in power, the longest occupation of any dictator in Africa. The military's immediate installation of his son, Faure Gnassingbé, as president provoked widespread international condemnation, except from France. Some democratically elected African leaders such as Abdoulaye Wade of Senegal and Olusegun Obasanjo of Nigeria supported the move, thereby creating a rift within the African Union. Gnassingbe left power and held elections, which he won two months later. The opposition declared that the election results were fraudulent. The events of 2005 led to questions regarding the government's commitment to democracy that had been made in an attempt to normalize relations with the EU, which cut off aid in 1993 due to questions about Togo's human rights situation. In addition, up to 400 people were killed in the violence surrounding the presidential elections, according to the UN. Around 40,000 Togolese fled to neighboring countries. Faure Gnassingbé was reelected in 2010 and 2015. In late 2017, anti-government protests erupted in Togo, the biggest since ones after the 2005 election. They demand the resignation of Gnassingbé, who is part of a family they say has been in power too long. The UN has condemned the resulting crackdown by Togolese security forces, and Gambia's foreign minister, Ousainou Darboe, had to issue a correction after saying that Gnassingbé should resign. Togo has an area equal to 56,785 km2 (21,925 sq mi) and is one of the smallest countries in Africa. It borders the Bight of Benin in the south; Ghana lies to the west; Benin to the east; and to the north, Togo is bound by Burkina Faso. Togo lies mostly between latitudes 6° and 11°N, and longitudes 0° and 2°E. The coast of Togo in the Gulf of Guinea is 56 km long and consists of lagoons with sandy beaches. In the north the land is characterized by a gently rolling savanna in contrast to the center of the country, which is characterized by hills. The south of Togo is characterized by a savanna and woodland plateau which reaches to a coastal plain with extensive lagoons and marshes. The highest mountain of the country is the Mont Agou at 986 m above sea level. The longest river is the Mono River with a length of 400 km. It runs from north to south. The climate is generally tropical with average temperatures ranging from 23 °C (73 °F) on the coast to about 30 °C (86 °F) in the northernmost regions, with a dry climate and characteristics of a tropical savanna. To the south there are two seasons of rain (the first between April and July and the second between September and November), even though the average rainfall is not very high. The coast of Togo is characterized by marshes and mangroves. High human population growth is leading to rapid deforestation, endangering many species. At least four parks and reserves have been established: Abdoulaye Faunal Reserve, Fazao Malfakassa National Park, Fosse aux Lions National Park, Koutammouko, and Kéran National Park. The most frequently observed animals are giraffes, cape buffalo, hyenas, and lions. Few elephants remain. Common birds are storks, cranes and marabou. The President is elected by universal and direct suffrage for 5 years. He is also the commander of the armed forces and has the right to initiate legislation and dissolve parliament. Executive power is exercised by the president and the government. The head of government is the Prime Minister, who is appointed by the president. Togo's transition to democracy is stalled. Its democratic institutions remain nascent and fragile. President Gnassingbé Eyadéma, who ruled Togo under a one-party system, died of a heart attack on 5 February 2005. Gravely ill, he was being transported by plane to a foreign country for care. He died in transit while over Tunisia. Under the Togolese Constitution, the President of the Parliament, Fambaré Ouattara Natchaba, should have become President of the country, pending a new presidential election to be called within sixty days. Natchaba was out of the country, returning on an Air France plane from Paris. The Togolese army, known as Forces Armées Togolaises (FAT), or Togolese Armed Forces, closed the nation's borders, forcing the plane to land in nearby Benin. With an engineered power vacuum, the Parliament voted to remove the constitutional clause that would have required an election within sixty days, and declared that Eyadema's son, Faure Gnassingbé, would inherit the presidency and hold office for the rest of his father's term. Faure was sworn in on 7 February 2005, despite international criticism of the succession. The African Union described the takeover as a military coup d'état. International pressure came also from the United Nations. Within Togo, opposition to the takeover culminated in riots in which several hundred died. There were uprisings in many cities and towns, mainly located in the southern part of the country. In the town of Aného reports of a general civilian uprising followed by a large scale massacre by government troops went largely unreported. In response, Faure Gnassingbé agreed to hold elections and on 25 February, Gnassingbé resigned as president, but soon afterward accepted the nomination to run for the office in April. On 24 April 2005, Gnassingbé was elected President of Togo, receiving over 60% of the vote according to official results. His main rival in the race had been Emmanuel Bob-Akitani from the Union des Forces du Changement (UFC) or Union of Forces for Change. However, electoral fraud was suspected, due to a lack of European Union or other independent oversight. Parliament designated Deputy President, Bonfoh Abbass, as interim president until the inauguration. On 3 May 2005, Faure Gnassingbé was sworn in as the new president and the European Union suspended aid to Togo in support of the opposition claims, unlike the African Union and the United States which declared the vote "reasonably fair." The Nigerian president and Chair of the AU, Olusẹgun Ọbasanjọ, sought to negotiate between the incumbent government and the opposition to establish a coalition government, but rejected an AU Commission appointment of former Zambian president, Kenneth Kaunda, as special AU envoy to Togo. In June, President Gnassingbé named opposition leader Edem Kodjo as the prime minister. In October 2007, after several postponements, elections were held under proportional representation. This allowed the less populated north to seat as many MPs as the more populated south. The president-backed party Rally of the Togolese People (RPT) won outright majority with the UFC coming second and the other parties claiming inconsequential representation. Again vote rigging accusations were leveled at the RPT supported by the civil and military security apparatus. Despite the presence of an EU observer mission, canceled ballots and illegal voting took place, the majority of which in RPT strongholds. The election was declared fair by the international community and praised as a model with little intimidation and few violent acts for the first time since a multiparty system was reinstated. On 3 December 2007 Komlan Mally of the RPT was appointed to prime minister succeeding Agboyibor. However, on 5 September 2008, after only 10 months in office, Mally resigned as prime minister of Togo. Faure Gnassingbé won re-election in the March 2010 presidential election, taking 61% of the vote against Jean-Pierre Fabre from the UFC, who had been backed by an opposition coalition called FRAC (Republican Front for Change). Though the March 2010 election was largely peaceful, electoral observers noted "procedural errors" and technical problems, and the opposition did not recognize the results, claiming irregularities had affected the outcome. Periodic protests followed the election. In May 2010, long-time opposition leader Gilchrist Olympio announced that he would enter into a power-sharing deal with the government, a coalition arrangement which provides the UFC with eight ministerial posts. In June 2012, electoral reforms prompted protesters to take to the street in Lomé for several days; protesters sought a return to the 1992 constitution that would re-establish presidential term limits. July 2012, saw the surprise resignation of the prime minister, Gilbert Houngbo. Days later, the commerce minister, Kwesi Ahoomey-Zunu, was named to lead the new government. In the same month, the home of opposition leader Jean Pierre Fabre was raided by security forces, and thousands of protesters again rallied publicly against the government crackdown. Togo is divided into five regions, which are subdivided in turn into 30 prefectures. From north to south the regions are Savanes, Kara, Centrale, Plateaux and Maritime. Although Togo's foreign policy is nonaligned, it has strong historical and cultural ties with western Europe, especially France and Germany. Togo recognizes the People's Republic of China, North Korea, and Cuba. It re-established relations with Israel in 1987. Togo pursues an active foreign policy and participates in many international organizations. It is particularly active in West African regional affairs and in the African Union. Relations between Togo and neighboring states are generally good. The military of Togo, in French FAT (Forces armées togolaises, "Togolese armed forces"), consists of the army, navy, air force, and gendarmerie. Total military expenditures during the fiscal year of 2005 totaled 1.6% of the country's GDP. Military bases exist in Lomé, Temedja, Kara, Niamtougou, and Dapaong. The current Chief of the General Staff is Brigadier General Titikpina Atcha Mohamed, who took office on 19 May 2009. The air force is equipped with Alpha jets. Togo was labeled "Not Free" by Freedom House from 1972 to 1998, and again from 2002 to 2006, and has been categorized as "Partly Free" from 1999 to 2001 and again from 2007 to the present (according to the government officials). It has very serious and longstanding human-rights problems. According to a U.S. State Department report based on conditions in 2010, these include "security force use of excessive force, including torture, which resulted in deaths and injuries; official impunity; harsh and life-threatening prison conditions; arbitrary arrests and detention; lengthy pretrial detention; executive influence over the judiciary; infringement of citizens' privacy rights; restrictions on freedoms of press, assembly, and movement; official corruption; discrimination and violence against women; child abuse, including female genital mutilation (FGM), and sexual exploitation of children; regional and ethnic discrimination; trafficking in persons, especially women and children; societal discrimination against persons with disabilities; official and societal discrimination against homosexual persons; societal discrimination against persons with HIV; and forced labor, including by children." Togo is among the smallest countries in Africa, but possesses valuable phosphate deposits and a well-developed export sector based on agricultural products such as coffee; cocoa bean; and peanuts (groundnuts), which together generate roughly 30% of export earnings. Cotton is the most important cash crop. The fertile land occupies 11.3% of the country, most of which is developed. Major crops are cassava, jasmine rice, corn and millet. Other important sectors are brewery and the textile industry. A permanent problem is the lack of electricity, because the country is able to produce only about a third of its consumption, the rest is covered by imports from Ghana and Nigeria. Low market prices for Togo's major export commodities, however, coupled with the volatile political situation of the 1990s and early 2000s, had a negative effect on the economy. Togo is one of the least developed countries; the economic situation is still precarious. Togo serves as a regional commercial and trade center. The government's decade-long efforts, supported by the World Bank and the International Monetary Fund (IMF), to carry out economic reforms, to encourage investment, and to create the balance between income and consumption has stalled. Political unrest, including private and public sector strikes throughout 1992 and 1993, jeopardized the reform program, shrank the tax base, and disrupted vital economic activity. Togo imports machinery, equipment, petroleum products, and food. Main import partners are France (21.1%), the Netherlands (12.1%), Côte d'Ivoire (5.9%), Germany (4.6%), Italy (4.4%), South Africa (4.3%) and China (4.1%). The main exports are cocoa, coffee, re-export of goods, phosphates and cotton. Major export partners are Burkina Faso (16.6%), China (15.4%), the Netherlands (13%), Benin (9.6%) and Mali (7.4%). In terms of structural reforms, Togo has made progress in the liberalization of the economy, namely in the fields of trade and port activities. However, the privatization program of the cotton sector, telecommunications and water supply has stalled. The country currently has no debt due to financial assistance from the outside while Togo is likely among the most beneficiary countries under the Initiative help in Heavily Indebted Poor Countries. 12 January 1994 devaluation of the currency by 50% provided an important impetus to renewed structural adjustment; these efforts were facilitated by the end of strife in 1994 and a return to overt political calm. Progress depends on increased openness in government financial operations (to accommodate increased social service outlays) and possible downsizing of the armed forces, on which the regime has depended to stay in place. Lack of aid, along with depressed cocoa prices, generated a 1% fall in GDP in 1998, with growth resuming in 1999. Togo is a member of the Organization for the Harmonization of Business Law in Africa (OHADA). Agriculture is the backbone of the economy, although it is struggling with a chronic shortage of funds for the purchase of irrigation equipment and fertilizers, which has significantly reduced agricultural output. Agriculture generated 28.2% of GDP in 2012 and employed 49% of the working population in 2010. The country is essentially self-sufficient in food production. Livestock production is dominated by cattle breeding. Mining generated about 33.9% of GDP in 2012 and employed 12% of the population in 2010. Togo has the fourth largest phosphate deposits in the world. Their production is 2.1 million tons per year. Since the mid-90s, however, there has been a decline in the mining industry and government will need to invest heavily to sustain it. The mining industry is facing difficulties due to falling phosphate prices on world markets and increasing foreign competition. There are also reserves of limestone, marble and salt. Industry provides only 20.4% of Togo's national income, because it consists only of a few light industries and builders. Large reserves of limestone allows Togo to produce cement. The November 2010 census gave Togo a population of 6,191,155, more than double the total counted in the last census. That census, taken in 1981, showed the nation had a population of 2,719,567. The capital and largest city, Lomé, grew from 375,499 in 1981 to 837,437 in 2010. When the urban population of surrounding Golfe prefecture is added, the Lomé Agglomeration contained 1,477,660 residents in 2010. Other cities in Togo according to the new census were Sokodé (95,070), Kara (94,878), Kpalimé (75,084), Atakpamé (69,261), Dapaong (58,071) and Tsévié (54,474). With an estimated population of 7,606,374 (as of 2016[update]), Togo is the 107th largest country by population. Most of the population (65%) live in rural villages dedicated to agriculture or pastures. The population of Togo shows a strong growth: from 1961 (the year after independence) to 2003 it quintupled. In Togo, there are about 40 different ethnic groups, the most numerous of which are the Ewe in the south who make up 32% of the population. Along the southern coastline they account for 21% of the population. Also found are Kotokoli or Tem and Tchamba in the center and the Kabye people in the north (22%). The Ouatchis are 14% of the population. Sometimes the Ewes and Ouatchis are considered the same, but the French who studied both groups considered them different people. Other Ethnic groups include the Mina, Mossi, and Aja people (about 8%). There is also a European population who make up less than 1%. According to a 2012 US government religious freedoms report, in 2004 the University of Lomé estimated that 33% of the population are traditional animists, 28% are Roman Catholic, 14% are Sunni Muslim, 10% are Protestant and another 10% belonged to other Christian denominations. The remaining 5% were reported to include persons not affiliated with any religious group. The report also noted that many Christians and Muslims continue to perform indigenous religious practices. The CIA World Factbook meanwhile states that 29% of the population are Christian, 20% are Muslim with 51% being followers of indigenous beliefs. Christianity began to spread from the middle of the 15th century, after the arrival of the Portuguese and Catholic missionaries. Germans introduced Protestantism in the second half of the 19th century, when a hundred missionaries of the Bremen Missionary Society were sent to the coastal areas of Togo and Ghana. Togo's Protestants were known as "Brema," a corruption of the word "Bremen." After World War I, German missionaries had to leave, which gave birth to the early autonomy of the Ewe Evangelical Church. Togo is a multilingual country. According to Ethnologue, 39 distinct languages are spoken in the country, many of them by communities that number fewer than 100,000 members. Of the 39 languages, the sole official language is French. Two spoken indigenous languages were designated politically as national languages in 1975: Ewé (Ewe: Èʋegbe; French: Evé) and Kabiyé; they are also the two most widely spoken indigenous languages. French is used in formal education, legislature, all forms of media, administration and commerce. Ewe is a language of wider communication in the south. Tem functions to a limited extent as a trade language in some northern towns. Officially, Ewe and Kabiye are "national languages", which in the Togolese context means languages that are promoted in formal education and used in the media. Health expenditure in Togo was 5.2% of GDP in 2014, which ranks the country in 45th place in the world. The infant mortality rate is approximately 43.7 deaths per 1,000 children in 2016. Male life expectancy at birth was at 62.3 in 2016, whereas it was at 67.7 years for females. There were 5 physicians per 100,000 people in 2008 According to a 2013 UNICEF report, 4% of women in Togo have undergone female genital mutilation, which is a significantly lower percentage than other countries in the region. As of 2015[update], the maternal mortality rate per 100,000 births for Togo is 368, compared with 350 in 2010 and 539.7 in 1990. The under 5 mortality rate, per 1,000 births is 100 and the neonatal mortality as a percentage of under 5's mortality is 32. In Togo the number of midwives per 1,000 live births is 2 and the lifetime risk of death for pregnant women is 1 in 67. In 2016, 5,100 people had HIV/AIDS. Education in Togo is compulsory for six years. In 1996, the gross primary enrollment rate was 119.6%, and the net primary enrollment rate was 81.3%. In 2011, the net enrollment rate was 94%, one of the best in the West African sub-region. The education system has suffered from teacher shortages, lower educational quality in rural areas, and high repetition and dropout rates. The dyed fabric batiks of the artisanal center of Kloto represent stylized and colored scenes of ancient everyday life. The loincloths used in the ceremonies of the weavers of Assahoun are famous. Works of the painter Sokey Edorh are inspired by the immense arid extents, swept by the dry wind, and where the soil keeps the prints of the men and the animals. The plastics technician Paul Ahyi is internationally recognized today. He practiced the "zota", a kind of pyroengraving, and his monumental achievements decorate Lomé. The official Togolese drink is called sodabi, a liquor that is created from the distillation of palm wine. On 12 August 2008, Benjamin Boukpeti (born to a Togolese father and a French mother) won a bronze medal in the Men's K1 Kayak Slalom, the first medal ever won by a member of the Togolese team at the Olympics. Football is the most recognized and national sport of Togo. Following suit with Nigeria, Ivory Coast, Cameroon, Ghana and Senegal, Togo qualified for the World Cup in 2006. Togo did not record a win in the group stage. Togo also qualified for CAF. Bachirou Salou was the first known footballer who paved the way for all the international Togolese soccer stars. He successfully played in the German Bundesliga for more than 14 years and is a living legend for the German Clubs Borussia Mönchengladbach and MSV Duisburg, where they even perpetuated him in their stadium. Salou gained 38 caps for Togo during a nine-year span. He played 300 games and scored 69 goals in the German major league. Emmanuel Adebayor is the most famous footballer for Togo, scoring 30 goals for the national team and 97 in the English Premier League. Togo has secular celebrations. Some of the celebrations include 1 January – "Fete Nationale" (meaning National Celebration in French) and 27 April – Independence day. These celebrations open a window for job opportunities and they attract more tourists. ^ "Constitution of Togo". 2002. Archived from the original on 14 February 2012. Retrieved 20 November 2011. ^ a b c d "Togo". CIA World Factbook. Central Intelligence Agency. Retrieved 26 October 2017. ^ a b c d "Togo". International Monetary Fund. ^ "Obituary: Gnassingbe Eyadema". (5 February 2005). BBC News. Retrieved 22 May 2007. ^ Ellis, Stephen (1993). "Rumour and Power in Togo". Africa: Journal of the International African Institute. Cambridge University Press. 63 (4): 462–476. JSTOR 1161002. ^ BBC News – Togo country profile – Overview. Bbc.co.uk (11 July 2011). Retrieved on 26 March 2012. ^ Farge, Emma (23 October 2017). "Gambian ministry says up to Togo to resolve crisis". Reuters. Thomson Reuters. Retrieved 26 October 2017. ^ a b "Togo: Africa's democratic test case". BBC News. 11 February 2005. Retrieved 15 November 2011. ^ "Togo leader sworn in amid protest". BBC News. 7 February 2005. Retrieved 15 November 2011. ^ "Togo succession 'coup' denounced". BBC News. 6 February 2005. Retrieved 27 June 2010. ^ a b Godwin, Ebow (8 June 2010). "Togo Leader to Step Down, Seek Presidency". Associated Press (via SF Gate). Archived from the original on 6 January 2006. Retrieved 27 June 2010. ^ "Technological shutdowns as tools of oppression". SciDev.net. 20 June 2005. Retrieved 27 June 2010. ^ "Togo's president re-elected: electoral agency". Sydney Morning Herald. 7 March 2010. Retrieved 16 November 2011. ^ "Togo opposition vows to challenge election result". BBC. 7 March 2010. Retrieved 16 November 2011. ^ "Togo leader Gnassingbe re-elected in disputed poll". Reuters. 6 March 2010. Retrieved 16 November 2011. ^ "Togo: 4,000 demonstrators protest Togo election results". AllAfrica.com. 11 April 2010. Retrieved 16 November 2011. ^ "Togo opposition 'to join coalition government'". BBC. 27 May 2010. Retrieved 16 November 2011. ^ "Togo profile". BBC. 11 July 2011. Retrieved 16 November 2011. ^ "Togo protest: Lome rocked by electoral reform unrest". BBC. 14 June 2012. Retrieved 26 July 2012. ^ "Togo PM, govt quit to widen leadership before vote". Reuters. 12 July 2012. Retrieved 27 July 2012. ^ "Huge rally in Togo". news24.com. 22 July 2012. Retrieved 27 July 2012. ^ "Organisation des Forces Armées". www.forcesarmees.tg. Retrieved 15 April 2011. ^ "Un Nouveau Chef à la Tête des FAT". www.forcesarmees.tg. Retrieved 16 April 2011. ^ "Togolese Air Force acquires CN235". defenceweb.co.za. 29 August 2012. Retrieved 5 July 2015. ^ "2010 Human Rights Report: Togo". US Department of State. Retrieved 11 January 2013. ^ "The Fact File". factfile.org. Retrieved 6 August 2018. ^ "Britannica". Britannica.org. Retrieved 26 August 2017. ^ a b c d e f g h i "The World Factbook — Central Intelligence Agency". Cia.gov. Retrieved 26 August 2017. ^ Joelle Businger. "Getting Togo's Agriculture Back on Track, and Lifting Rural Families Out of Poverty Along the Way". ^ "Togo | Location, History, Population, & Facts". Encyclopedia Britannica. Retrieved 20 February 2019. ^ Khan, M. Ali; Sherieff, A. & Balakishan, A. (2007). Encyclopedia of world geography. Sarup & Sons. p. 255. ISBN 81-7625-773-7. ^ Life, Pew Research Center’s Forum on Religion & Public (1 December 2012). "The Global Religious Landscape: A Report on the Size and Distribution of the World's Major Religious Groups as of 2010" (PDF). Pew Research Center. Archived from the original (PDF) on 24 September 2015. Retrieved 4 October 2018. ^ "Togo 2012 International Religious Freedom Report" (PDF). p. 1. Retrieved 16 May 2018. ^ Decalo, Samuel (1996). Historical Dictionary of Togo. Scarecrow Press. p. 74. ISBN 9780810830738. ^ "Languages of Togo". Ethnologue.com. Retrieved 31 October 2010. ^ "Togo". Ethnologue.com. Retrieved 26 August 2017. ^ "The State Of The World's Midwifery". United Nations Population Fund. Accessed August 2011. ^ a b c "Togo" Archived 2 February 2008 at the Wayback Machine. 2001 Findings on the Worst Forms of Child Labor. Bureau of International Labor Affairs, U.S. Department of Labor (2002). This article incorporates text from this source, which is in the public domain. "Togo". The World Factbook. Central Intelligence Agency.